Marriage was instituted by God, not invented by man (cf. Catechism of the Catholic Church, n.1603). The Creator has built it into human nature, even into the human body, in its two complementary forms, male and female. ‘Male and female He created them’ (Gen.1: 27): man for woman, and woman for man, united in marriage as ‘one flesh’ for the procreation of new life: ‘Be fruitful and multiply’ (Gen. 1: 28). God has given marriage its essential characteristics and proper laws: unity (one man married to one woman); indissolubility (nothing but death can end a marriage); and openness to procreation (in every act of physical love). No president or religious leader, no senate or synod, nor any government, has the authority to re-define marriage. Our Lord Jesus Christ, the Incarnate Son of God, raised marriage to the dignity of a Sacrament. 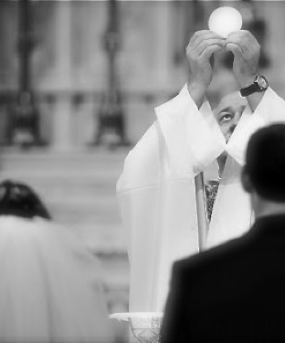 The marriage of a Christian man and woman is a sacramental sign of His union with His Church (cf. Eph. 5: 32). 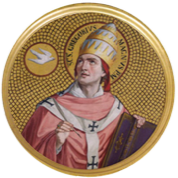 Since the union of Christ with the Church, His Bride, cannot be dissolved, no power on earth, not even the Pope himself, can dissolve the valid sacramental marriage, once consummated, of a Christian man and woman. ‘Those whom God has joined together let no man put asunder’ (Mt. 19: 6). Christ and His Church that is signified and effected by the Eucharist. In the absence of a clear appreciation of marriage and the true meaning of human sexuality, a number of associated moral challenges have arisen. Amongst these is the growth of widespread homosexual activity and the promotion of such behaviour. The Church teaches, as she has always taught, that homosexual activity is gravely sinful, as it distorts one of the most sacred and fundamental dimensions of human life. 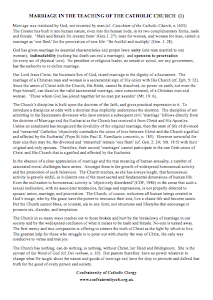 Even the inclination to homosexual activity is ‘objectively disordered’ (CDF, 1986) in the sense that such a sexual inclination, with its associated tendencies, feelings and expressions, is not properly directed to spousal union, marriage, and procreation. The Church, of course, welcomes all human beings created in God’s image, who by His grace have the power to renounce their sins, live a chaste life and become saints. But the Church cannot bless, or tolerate, sin in any form, nor structures and lifestyles that encourage or promote sin, disorder, and temptation. The Church in so many ways reaches out to those broken and hurt by the breakdown of marriage in our society and by the widespread confusion of what it means to be male and female. No-one is turned away. The first mercy and true compassion is offering to sinners the truth of Christ as the light by which to live. The greatest help for those who struggle is to point out with charity the way of Christ, the only way conducive to virtue and true joy. The Church has nothing, can do nothing, is nothing, without Christ, her Head and Bridegroom. She is the servant of the Word of God (cf. Dei verbum, n. 10). Her pastors therefore have no power whatever to change what He taught about the nature and goods of marriage and have the duty to promote and defend that truth for the good of every person and society. Click here for the 2015 Colloquium website, which includes photographs.